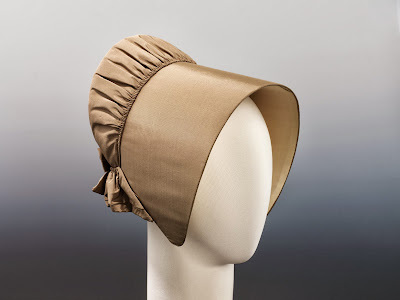 SilkDamask : A Quaker in China & Her 1845 Bonnet: "I long to show thee my very pretty bonnet"
A Quaker in China & Her 1845 Bonnet: "I long to show thee my very pretty bonnet"
It was July 5th, 1843 and Rebecca Chase Kinsman (1810-1882) departed her home port of Salem, Massachusetts for Macao and Canton, China. 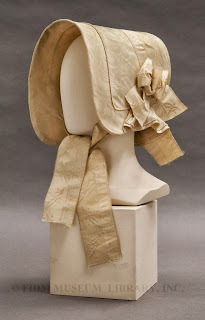 Joining her on the ship Probus (with Captain John Sumner at the helm), was her husband, Nathaniel Kinsman (1798–1847), and two of their three children, Nattie and Ecca. Nathaniel was taking up a position in Canton with the trading house of Wetmore and Company, and the couple had made the atypical decision in antebellum America to travel together to what was then an exotic and strange world. Indeed, the diaries and letters shared between the couple offer a rare glimpse into an early American household that challenges conventional interpretations. The written record for the Kinsman family is particularly strong. Not only have a decade of letters between husband and wife and their respective families survived, but also household receipts, diaries, and Nathaniel’s ship logs are among the rich collection housed at the Phillips Library at the Peabody Essex Museum, the Schlesinger Library, the Smith College Library and private hands. Rebecca frequently provided detailed descriptions of her travels throughout Macao, who she met, where she walked, how she organized her new domestic responsibilities. Seen through her Western lens, she was clearly cognizant that her time in China marked an important episode in her life. Her letters and journal entries are significant in that we have few accounts by women travelers and expatriates to Macao during the 19th century (or any time for that matter). So the question that comes to mind, given that Rebecca notes her new bonnet "has more trimming on it than I usually wear" is did her bonnet look more like the one pictured from the FIDM Museum Library or the more traditional Quaker bonnet shape from the Metropolitan Museum? Kimberly Alexander, “‘Demure Quakeress’: Rebecca Kinsman in China, 1843–1847.” Dublin Seminar for New England Folklife Annual Proceedings, 2006/2007. (Boston: Boston University, 2009): 102-113.